﻿ Greeting card lip balm reviews on EdenFantasys. 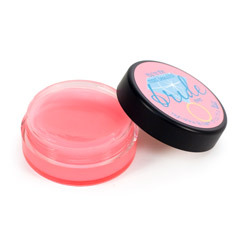 This is an absolutely great lip balm and a fantastic price. Do not hesitate to pick this one up for yourself, a friend, a loved one, or even a complete stranger. I definitely recommend this to anyone looking for a great lip balm at a good price. You get twice as much as you would expect to get, and a little goes a long way with this stuff. Goes on smoothly and lasts all day, as long as you're not touching your lips constantly like I am. This lip gloss pot is a lovely way to say thanks or show that special lady you are thinking of her. It's not the most amazing gloss in the world but it does leave the lips soft and kissable. Be aware that the colors shown on the site are not necessarily what you will receive so if color is an issue talk to customer support. Cute gift, not the best lip balm. Final summation: If you want to get someone a cute gift at a cheap price, one of these is a cute idea. Goes great with some flowers or jewelry. It's not enough to wow anyone at being a great lip balm, but the "from the heart" aspect makes it a good gift.